Every cat who is boarded with you will should have had a vaccination booster during the past year. 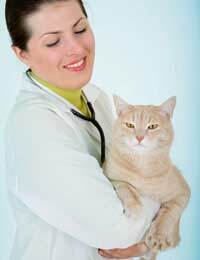 The cat vaccinations cover the cats against feline enteritis and cat flu. There are other cat vaccinations which cover against leukaemia, but at the moment these are not a compulsory factor in the boarding of cats. Before accepting any cat into your boarding cattery you will need to see their certificate of vaccination. This is a card filled out by the vet that gives the date the first vaccinations were given, when the annual booster was administered and the date that the next booster is due. Without the records of vaccination you should not board any cat. If the owners forget to bring the proof that their cat has had his/her injection, you can always phone their vet and check when the cat was last vaccinated. If the vet cannot confirm that the cat annual injections have been given you should not accept the cat for boarding. Your licence to board cats will be issued to you on the understanding that all cats boarded with you will have annual booster injections. If you have insurance to cover the cats in your care they will stipulate that the cats need to be fully vaccinated. The feline enteritis and cat flu that the cat injections protect against can be killers. The injections have not eliminated them entirely but they are much rarer, however if one cat in your cattery has either of these illnesses, the germs will spread, and even cats who have had their annual boosters could catch the virus. The virus is airborne and as one cat sneezes the germs are in the air and can spread rapidly. To protect all the cats in your cattery every one of them must have annual booster injections. Many of the cats you board will lead an outdoor life and could easily come into contact with feral cats who could carry the virus. When taking a booking over the phone, you must make it absolutely clear that you will not accept a cat into your cattery without a record of vaccination being provided. You should make it clear that annual booster is necessary. You might be surprised at the number of owners who think that the one set of injections is enough and forget all about annual boosters. If anyone does turn up at your cattery with an unprotected animal it is in your own (and the cattery's) interest to refuse to board the cat. If the owner is just about to jet off on holiday this can cause alarm and ill feeling, but you must stick to your rules. Much better to have one disgruntled customer than take the chance on having a cattery full of sick animals. If you feel inclined, you could provide some emergency pens well away from your main cattery where you could house the unvaccinated cat. That way perhaps you could help the customer and not put the other cats at risk.